Received an interesting message from an old friend tonight. Among other things, he said he has been keeping track of my journey from his vantage point way out in Portland, Oregon. While still a fervent believer in Jesus (this guy is the real deal, by the way), he said that much of what I've had to say of late has resonated with some of his own personal doubts. Then, toward the end of the email, he asked me this: "So how is life without God?" What is interesting to me is that of all the many Christians who have taken issue with my recent confession of atheism (and my vocal rants that have accompanied it), this was the first time a Christian genuinely asked me what life was like on the other side. I suspect most Christians either do not want to know, couldn't handle the answer, or just don't care since it's something about which that they're perhaps not the least bit curious. And that is just fine. Nevertheless, I did appreciate the question from this dear friend of mine, mostly because, well, it's like getting married and having no one ask you if you're enjoying married life. Finally, when someone does ask you, you're sort of like, "Thank you for asking! I've been waiting for someone to do just that!" After all, even atheists like to know that they matter. So what about that question? What is life without God like? Honestly, it's much like life with God was. It's really not that different, and yet it is profoundly different. I suppose I could compare it to a divorce. In many ways, life goes on. You still eat, drink, sleep, go to the store, watch TV, read books, and any other number of random activities that make up the average life. But, in other ways, it's different now, too. That spouse is gone. Now you're reading books alone. Now you're sleeping alone. Now your routine is a bit thrown off because, well, the other human being you used to share your life with is gone. Becoming an atheist is a bit like that. On the one hand, your life is still your life. The sky is still blue. The cat's breath still smells. The hot water in the shower still doesn't last long enough. But on the other hand, you are profoundly different on the inside, because a part of you is gone. There is loss there, yes. Anytime we are separated from something or someone we used to love, there is loss. Loss isn't always bad, but it is almost always sad. One might therefore be justified to wonder or ask if I mourned the loss of God. The truth is, yes I did. And in many ways, I still do. Listen, no one can traverse the Christian realm for a decade or more, "walking with God," and revolving one's entire life around his faith and biblical values without that becoming a very huge part of who he is and what made him that way. My years in Christianity formed me. Some for good, mostly for ill. But I cannot escape that a large chunk of my life was spent on that road. And while I walked that road, there was a belief that I was not walking it alone, that there was the Great Unseen walking with me, directing me, comforting me, encouraging me, and loving me. No one can believe that and live that way for years and years and years and then not have the loss of that be a painful thing. Was it a painful thing? Oh yes. Very much so. But this doesn't mean my decision was the wrong one. I'm not saying I can't be wrong (I could be, though I don't think I am), I'm just saying that the pain of the loss doesn't mean the loss wasn't necessary. When I see a beautiful sunset, I can no longer thank God for it, because God isn't there to hear me. So, whom should I thank? The Christian asks this often. It was necessary. The sad thing for the Christian is that he can never know this until after it has happened. After all, you can only know the full extent of the Matrix after you've been unplugged from it, yes? Only from the outside can you see the evil of the Matrix. While you're in it, your perspective is limited. Hell, you don't even know it's there while you're in it. You have to be unplugged first, then you can see its scope and the sick, twisted thing that it is. 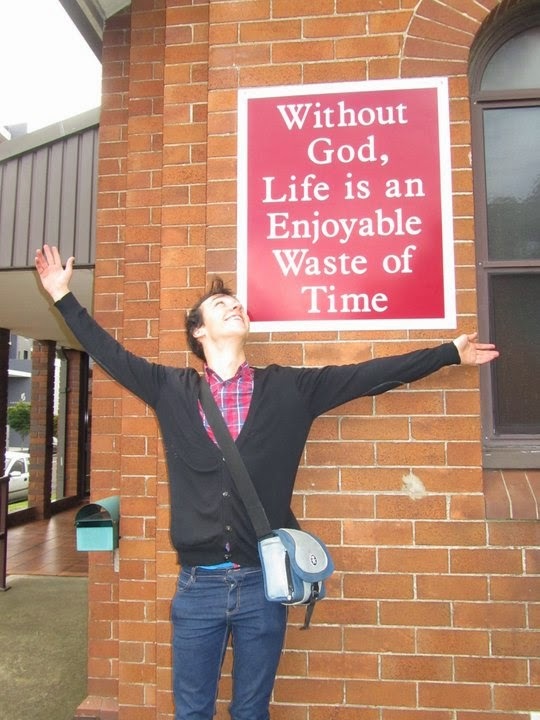 Anyway, life without God is definitely different in some ways. When I see a beautiful sunset, I can no longer thank God for it, because God isn't there to hear me. So, whom should I thank? The Christian asks this often. "Who do you thank," they ask, "when you're particularly grateful for this or that?" I think the answer is quite simple: feeling thankful and expressing thanks are not the same thing. I can look at beauty or wonder or anything that moves me and feel thankful that I am here to see it and experience it, but this doesn't mean I have to say "Thank you" to anyone in particular. It's enough for me that I'm here to experience that for which I'm thankful. Another difference is that when a crisis arises I cannot go running to God to bail me out. But I don't think I need to explain why this isn't necessarily a bad thing. After all, there's something to be said about standing up and facing something on your own. Overall, the net effect has been positive. The crippling guilt I used to live under has been swept away. The ambivalence about what this God may or may not have been saying to me is no more. The ongoing feeling of constantly falling short has been obliterated (you can't be guilty of failing God's standard if there is no God there to demand it). I no longer feel like I have to apologize for being born. I no longer have to find my worth in something I can't see and which I'm not entirely sure is even there to begin with. I no longer have to believe that God could only accept me once I was bathed in the blood of the son he ostensibly killed (how messed up is that, anyway?). I don't have the shackles of faith, limiting my mind to what my heart had to believe was the truth. I no longer have a book doing my thinking for me; I am free to form my own conclusions. I no longer have to live in fear of God's anger and punishment, because those disappear when he does. I no longer have to see the world in terms of who is going to heaven and who is going to hell, because those places don't exist. I no longer have to put all my hope in the next life; I can find meaning and value in this life and therefore live it all the more fully now. I am free to be myself, and let my inner light shine. I can fly now, where once I could only crawl. Life without God is quite good, in fact. It's sort of like waking out of a bad dream and realizing you're so glad the monster wasn't real and that you're actually safe and sound in your bed. Yes, it was all just a dream. It began as a good dream but it went south with a vengeance. I'm just happy to be awake now. And as a writer, I still cannot find a way to describe what it is like. I know the joy of "experiencing God," because I used to do so all the time (though this experience, I now know, was taking place only in my head). It was always a sort of nervous joy, a joy underpinned with a sort of unspoken fear and apprehension. I also know the "peace" of experiencing God. It was never quite peace, however. It was more like forced tranquility that you're telling yourself is real even though you know you're a damn liar. And it never lasted. But since letting go of God, I have slept better, felt better, behaved better, reacted better, and experienced a peace and joy that is deeper, has lasted longer (still here, in fact), and has been much more quietly penetrative than anything I ever experienced with God. Life without God? Two thumbs up.